Having spent the better part of 20 posts focusing on the Disneyland Park, I thought it high time I get to work on Disney’s California Adventure. Before I launch into this post, please give my California Adventure Overview a read. This will give you a better understanding of what the park is about, before we get into the specifics. First up we take a look at the attractions of Buena Vista Street and Hollywoodland. I’m going to keep this one short and sweet. While beautiful, Buena Vista Street is basically Mainstreet USA but with fewer attractions. There are plenty of restaurants and shops but very little of anything else. It features one transport ride. 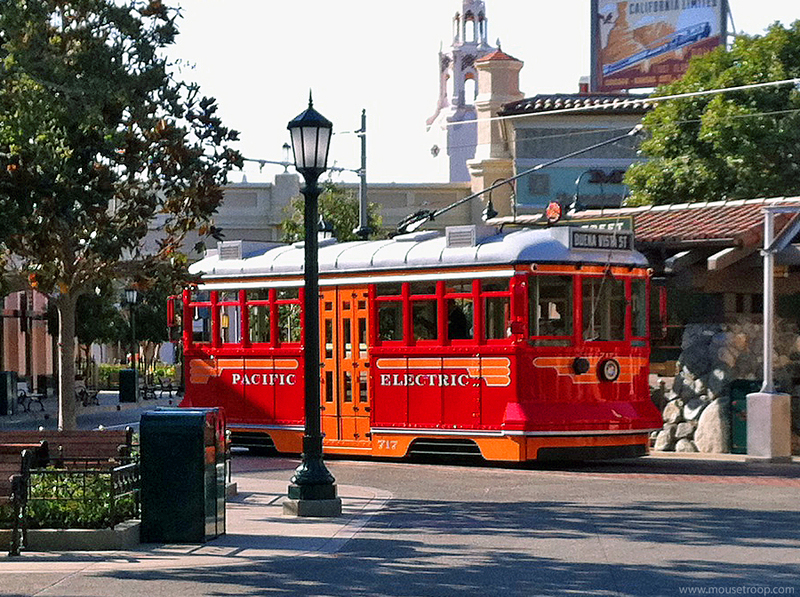 The Red Car Trolley. Much like it’s Mainstreet counterparts, however, it serves more as an atmospheric addition rather than a must do! Apart from a bit of shopping, the occasional feed or a little street entertainment, you will spend a total of 2 minutes a day in this particular section of the park. The Red Car Trolley: Image thanks to Mouse Troop. With the official announcement of Marvel Land, Hollywoodland’s future looks bleak. It is currently the least popular area of California Adventure and looks certain to be on the way out, making way for the aforementioned expansion. While it still exists though, I shall report on everything that this area still has to offer. Unlike Australian drop rides, such as Dreamworld’s “Giant Drop” and Movie World’s “Batwing Spaceshot”, Guardians of the Galaxy is completely enclosed in a show building and involves more than just one or two drops. It features a great Rocket Raccoon animatronic as part of the intro segment and a number of clips and special effects to enhance the story, throughout the ride. There is much debate as to whether the old version of this ride should have remained but considering the future development of Marvel Land, it won’t remain debatable. The basic premise for the Guardians of the Galaxy ride centres around “The Collector” from the first movie. He has imprisoned the Guardians as part of his galactic museum and you assist rocket to get them out. I feel like a broken record but the theming of this queue is, as always, quite brilliant. It features plenty of memorabilia from the movies, as well as some great references to old Disney attractions. Like the Haunted Mansion, Guardians takes you to a pre-show room, where you are welcomed by “The Collector” (Tanaleer Tivan) on a screen to begin a VIP tour of his museum. He is soon interrupted by the lifelike Rocket animatronic , who devises a plan to free his friends. Unfortunately this means, messing with the control panels, which will free every alien/monster in the Museum as well. From the Pre-Show you enter the fray via a highly unsafe gantry elevator! The plan is set in motion and as you continually drop up and down you are shown scenes of the mayhem that is unfolding in the museum. After a series of gut churning drops and lifts the guardians are saved and you all escape together…with one final drop of course! Another happy ending! “Hit Me with Your Best Shot” by Pat Benatar. “Give Up The Funk” by Parliament. “Born to Be Wild” by Steppenwolf. “I Want You Back” by The Jackson 5. “Free Ride” by The Edgar Winter Group. “Burning Love” by Elvis Presley. Hands up who enjoys that wonderful heart in mouth feeling? If the answer is yes, then this ride is definitely for you! If not, go on it anyway because it’s the best drop type ride I have been on. Most importantly, the indoor factor reduces fear of heights exponentially. A must do! Spoiler Alert: Please find the POV video of Guardians of the Galaxy below courtesy of Theme Park HD. Entrance to Mike and Sulley to the Rescue: Image thanks to Imagineer Rebirth. 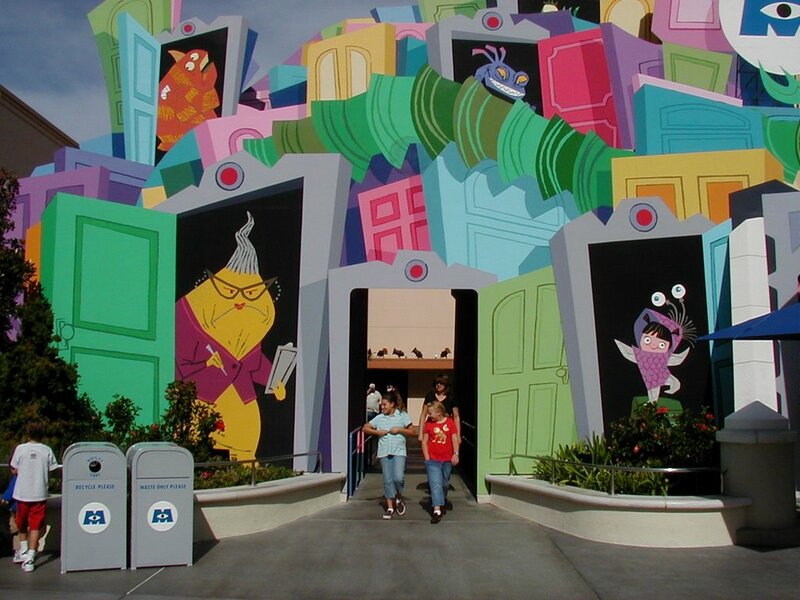 When it originally opened, the Monster’s Inc. Dark ride was a more than welcome addition to California Adventure, having replaced what is considered to be the worst ride in Disneyland History: The Superstar Limo. Like all Disney Dark Rides, Mike and Sulley to the rescue simply takes you through scenes from Monster’s Inc. mostly with Boo on the loose in Monstropolis. If you didn’t go on a dark ride across the ditch at Disneyland then you can do this one. It’s a little better than most other Disney Dark Rides but still not extremely exciting. As California Adventure is aimed at older visitors, Family’s with children under 12 should add Monster’s Inc. to their list. Spolier Alert: Here is a POV of the Monster’s Inc. Ride thanks to EvanTube HD. This movie theatre was home to The Muppet’s for over a decade and featured a 20 minute 3D Muppets short. Since closing in 2014, it has simply been used for synergetic marketing purposes. Basically when a new Disney film is coming out, the theatre will show an extended trailer/behind the scenes clips. It will also include memorabilia from the upcoming movie in the foyer area. At the moment the theatre is showing Pixar Shorts, for Pixar Fest, including For the Birds (My favourite short) and La Luna. Like Path of the Jedi, KEEP AWAY! It is another waste of precious park time! Basically anything they show here can be found on YouTube! The Disney Animation Building in Hollywoodland features a few attractions that are great for kids but not really anyone else. The general advice here is to skip these if any of your party are under 12. The Disney Animation Building houses three interactive exhibits. A little tutorial where you learn to draw Disney characters. Great opportunity for kids, especially considering the finished products can double as souvenirs! An interactive walkthrough exhibit that reveals how Disney characters come to life. It contains two major areas: The Magic Mirror Realm and Beast’s Library. Again, nothing overly exciting but the interactive elements aren’t too bad, with the “Which Disney character are you?” game somewhat popular. This attraction is actually quite good, due to its clever use of technology. It starts off as your typical theme park style movie but turns into an interactive, live chat with Crush and Dory from the Finding Nemo films. The general animation stays the same every time but the mouths change to sync up with whatever the voice actors are saying, through a special microphone. This makes it a really re-watchable attraction for kids and adults alike. Essentially all you need to know about the attractions in both these areas is that they aren’t particularly great. Aside from Guardians of the Galaxy there isn’t too much excitement in these areas. There’s some fun things to do for families with kids but not much to interest others. Great place to escape the crowds though, as it is pretty dead most of the time. Note: I haven’t mentioned the Hyperion Theatre (Which houses the Frozen Musical), as I will cover this in my California Adventure Shows Post.